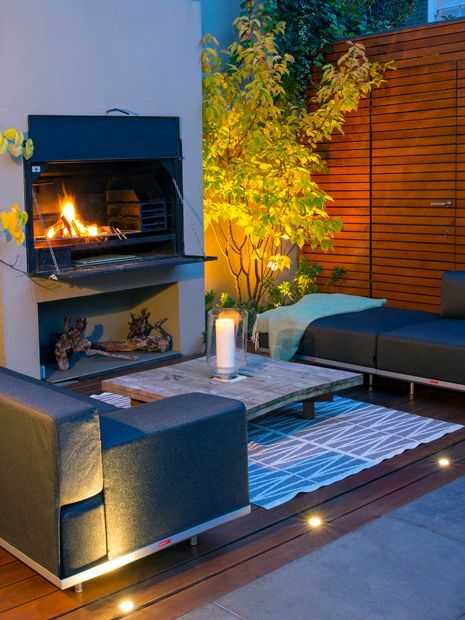 Trendsetting, highly detailed and consummately low-maintenance, small town courtyard gardens provide many London garden designers with a valuable reservoir of cutting-edge design ideas. 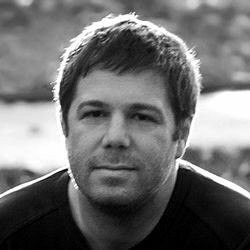 This inspiring renewability finds its creative estuaries in the flow of myriad design disciplines, methods and artistries, redefining both our thinking and clients' garden lifestyles within scalable scopes, reinterpretations and innovations. 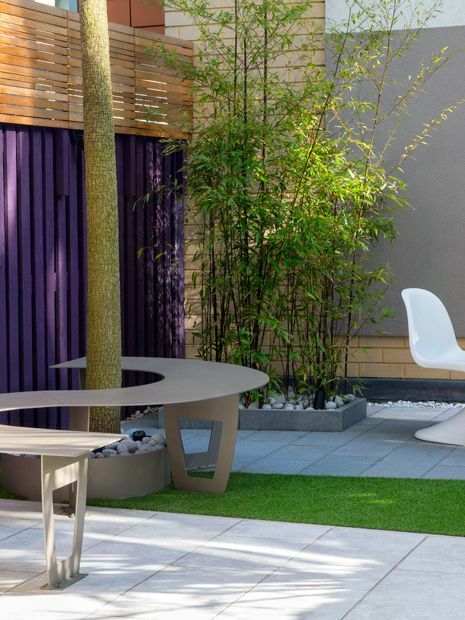 From minimalist compositions to intricate water features, diverse foliage and intimate seating areas, small city gardens embody contemporary urban living in London as the nuclei of garden design. A small family town garden in North London NW8. 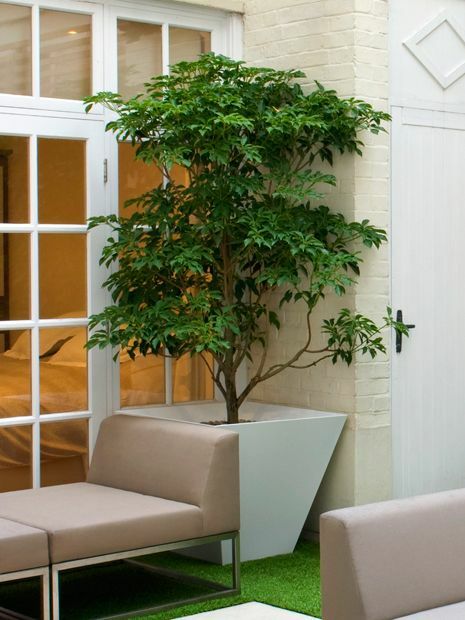 Enveloped by mature trees, this small town courtyard garden design features distinctive alternating focal points in each aspect, catering for all family members of a contemporary North London household. 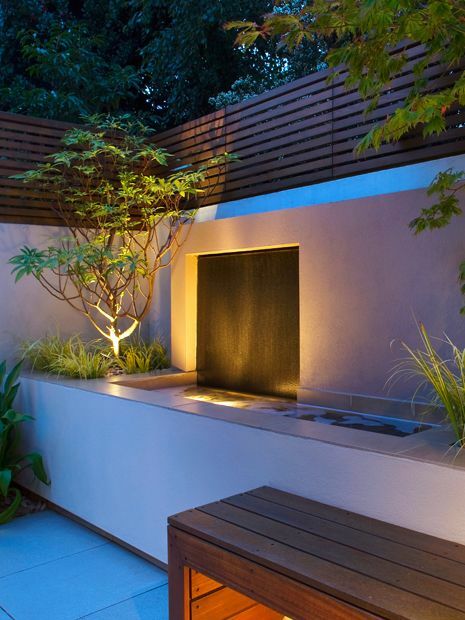 While water cascades tranquilly across a textured granite waterfall, offset to the right, cavernous custom-built benches emit a soothing afterglow, anchoring the garden's key vantage point. Drainage flows from surfaces back to the ground, as hollow raised beds reclaim leaf litter. 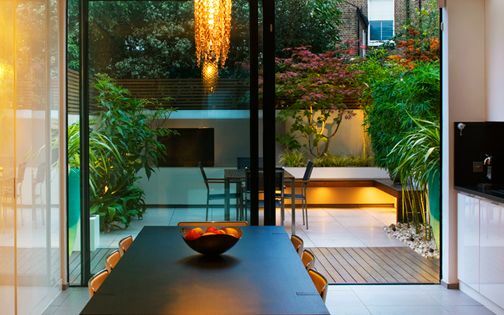 Sculptural shrubs, leafy perennials and Silver birches gradate scale beneath tall canopies, above natural sandstone and hardwood, in a multilayered composition of indoor-outdoor compatibility. 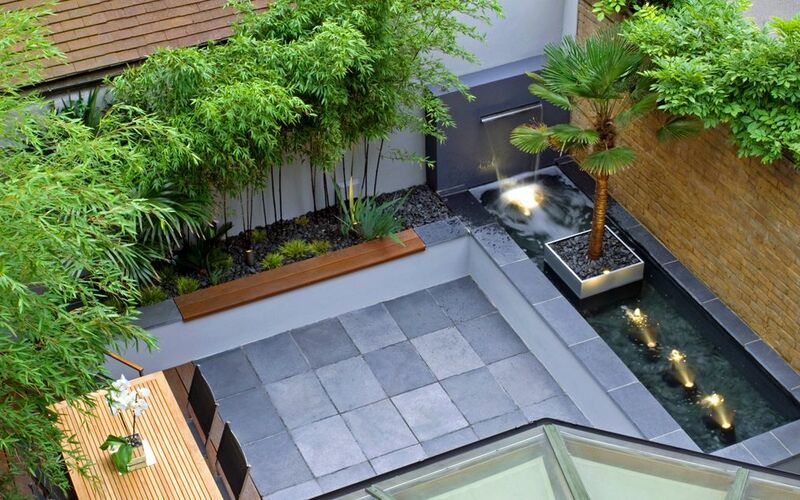 A small modern courtyard town garden in South London SW4. 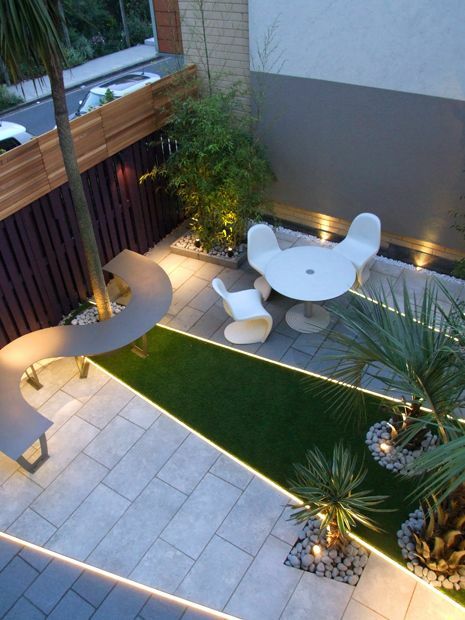 Five outdoor zones in fifty square metres accommodate the ultimate modern alfresco lifestyle in this small town courtyard garden design. 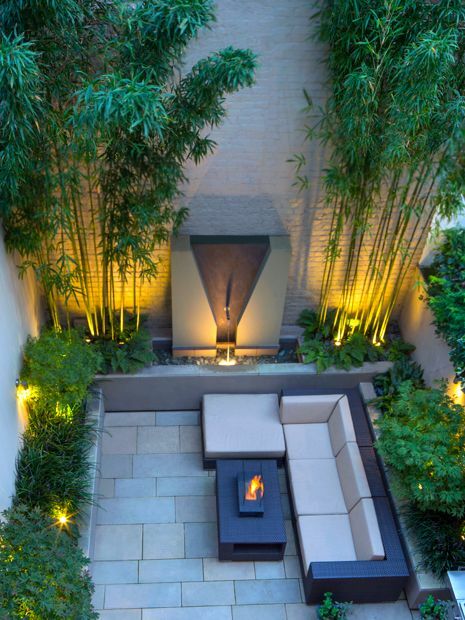 With dimensional smallishness aside, our clients embarked on their unique home renovation with a clear vision and a detailed attention to the garden, where a contemporary walled courtyard maintains an architectural flow – mirroring the living room's surfaces, lighting and creature comforts. 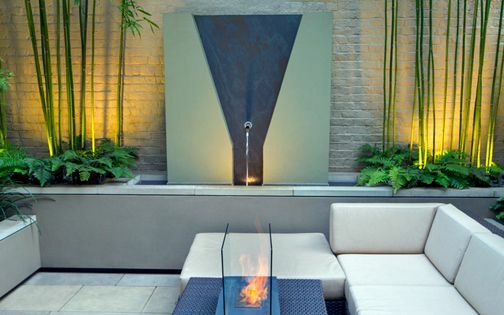 A waterfall, sculpture wall, dining area, fire oven, hidden bar, lounge sofas and distinct plant borders entice, entertain and utilise every inch of usable space as a low maintenance garden. A small city courtyard garden in North London N5. 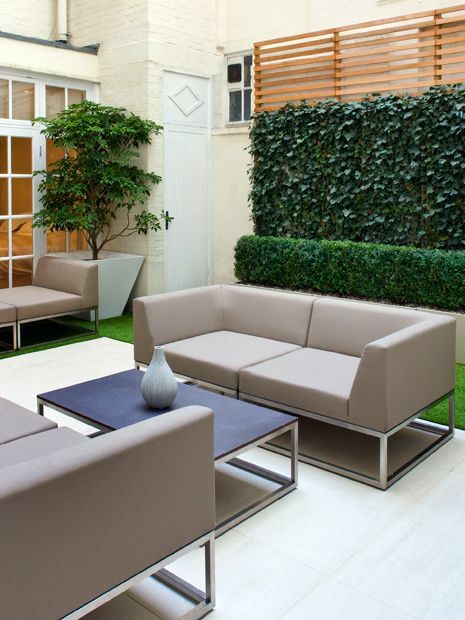 When clients mainly frequent their London garden for social get-togethers, entertainment niftiness tops the design brief – none more so than in small town courtyard gardens. 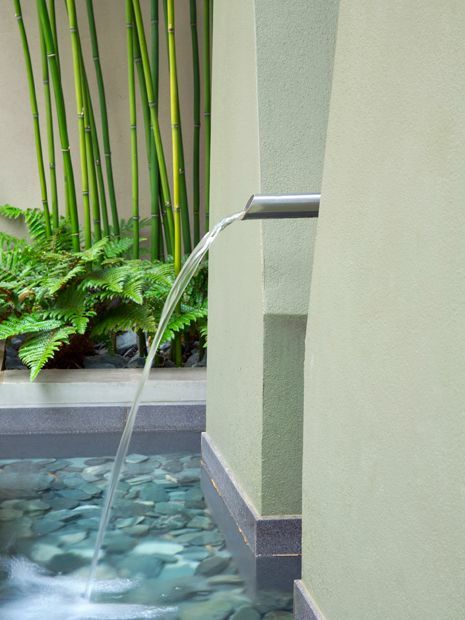 With precisely forty square metres to master, cubically formed and aerially viewed, this tiny city courtyard required some lateral garden design thinking to fulfil both hassle-free functionality and architectural specialness. 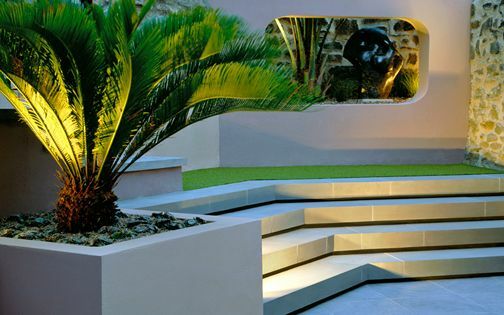 Meandering around the tall torso of an existing Palm tree, a curved custom-built steel bench maximises the western light vantage point, contrasting a diagonal criss-cross grid of surface materials which conserves all of the garden's original mature vegetation in its path. 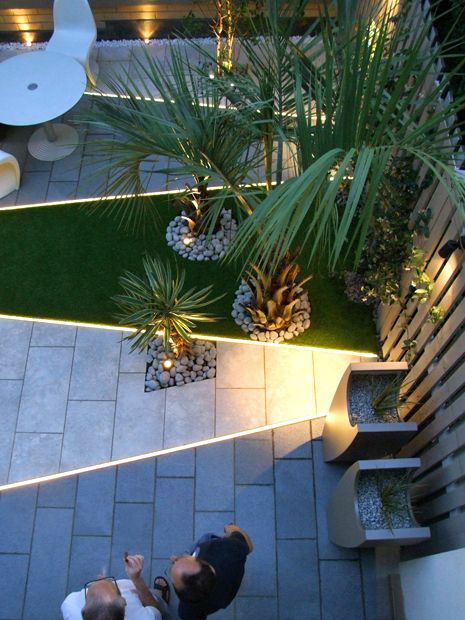 Bespoke planters, Cedar-clad screens, artificial grass, limestone, granite, a deep colour palette and vibrant LED light strips all focalise this small but potent garden composition, where our outgoing Italian clients can convert precious free time into a thrilling outdoor occasion all year round. 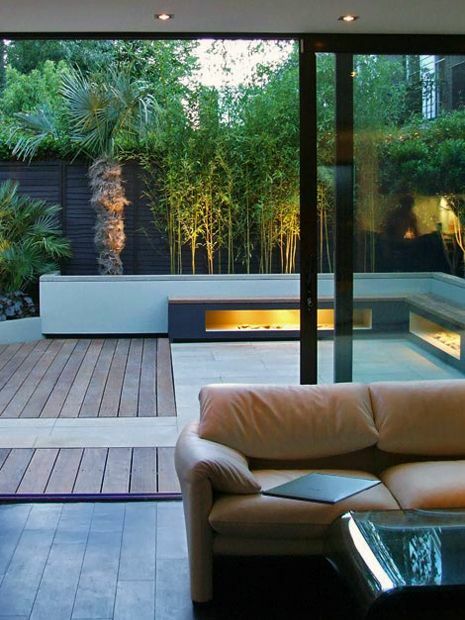 A small urban courtyard garden in South London SW6. 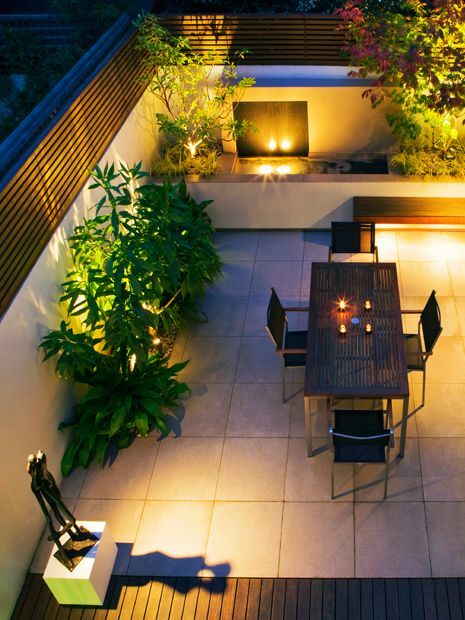 With a balanced seven by five metre perimeter, this small urban courtyard garden sidesteps the tininess of Fulham's smallest street and its minified back gardens, inspiredly paired with a roof terrace, an atrium and a front garden. 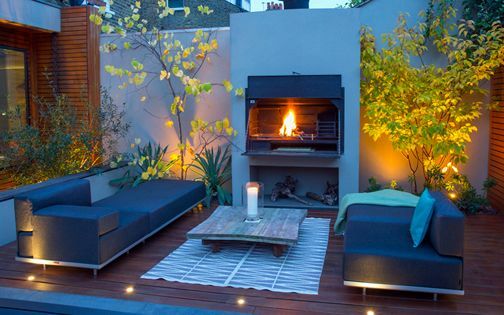 Collectively embraced, this sequence of outdoor spaces caters for an entire family, where the Bulgarian-Dutch owners replenish demanding European work schedules with luxuriant foliage and night-time illuminations. 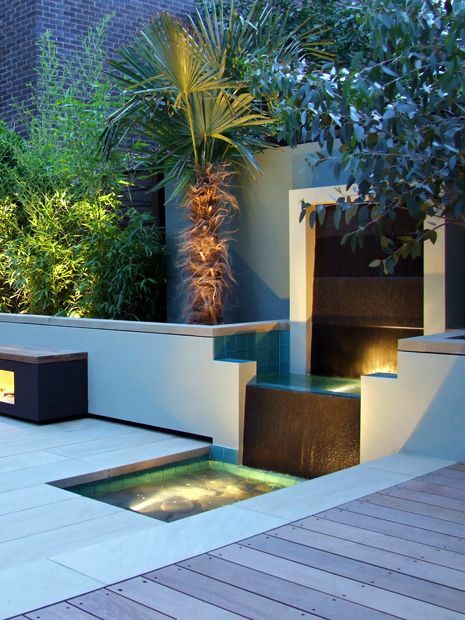 Socially cosy, discreetly secluded and rigorously detailed, this small courtyard garden design generates a nattier though comfier year-round platform which treasures natural materials, foliar diversity and realist usability – further focalised by floating benches, a sleek waterfall and modern garden sculpture. A small town courtyard garden in Central London W1. 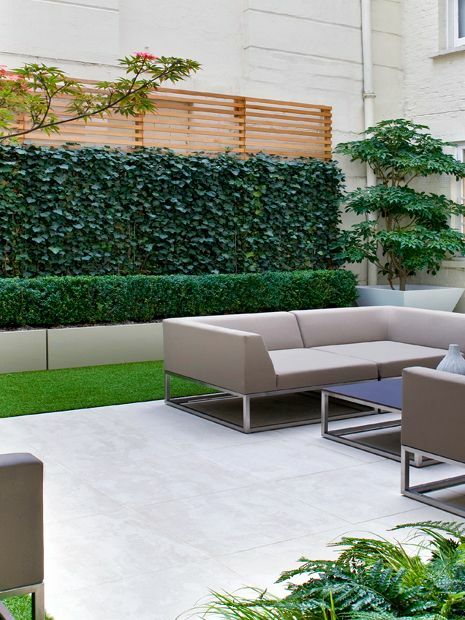 Classically expressed through every bit of a 43-square-metre Central London modern courtyard garden, our Belgian clients exemplify their homeland's verdant minimalism with cool architectural sophistication. While Belgium propagates more hedging and topiary fashionistas than any other small continental country, this four-square yet anatomically well-proportioned small town courtyard garden finds its motherland's green symmetries on native London soil, however tinily scaled-down, heavily shaded, or completely containerised. 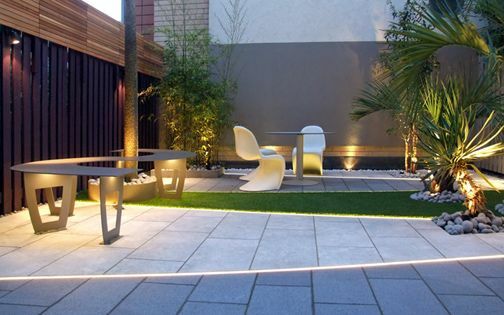 Porcelain tiles, synthetic grass, Cedar trelliswork, custom-made planters, heaters, lighting and irrigation contribute well-equipped conveniences, overlaid by Belgian furniture – maximising courtyard centrality in outdoor design luxury. 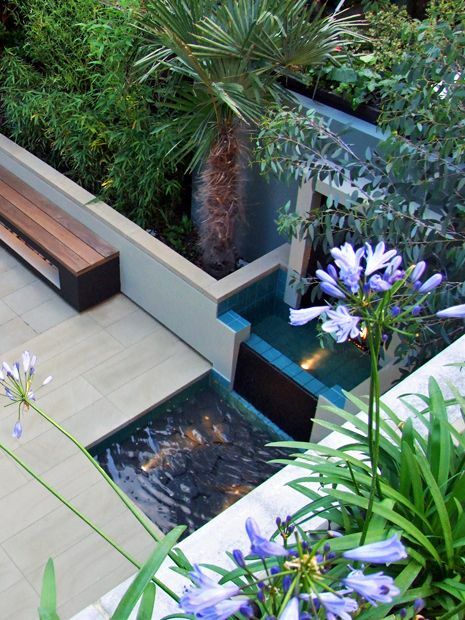 A small city courtyard garden in Central London SW1. 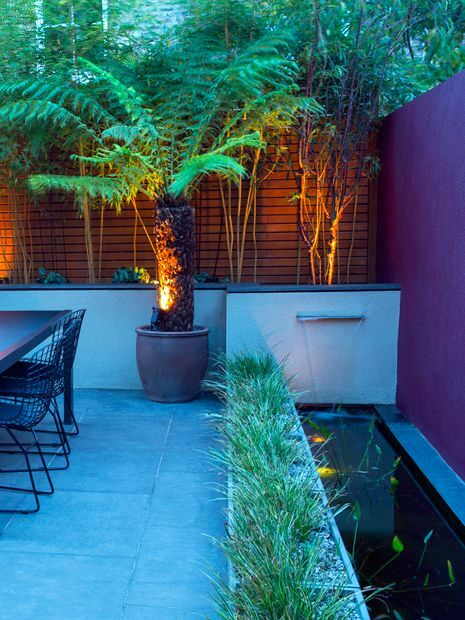 Although compressed within a 32-square-metre outline of deep urban shade, and dwarfed by a 5-storey Georgian townhouse, this small city courtyard garden capably reinvigorates our Russian-English clients in symmetrical comfort. 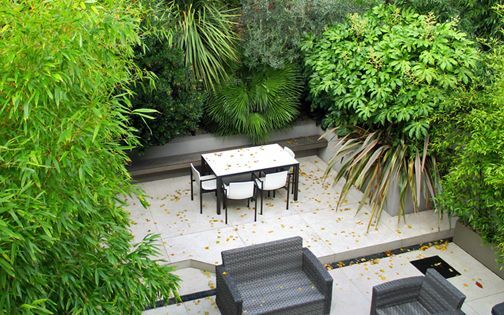 The owners' classic-contemporary concord aptly permeates the garden design, where traditional surface materials and commensurable patterns delineate a visual competency on a par with the residence's interior decor and Belgravian grandeur. 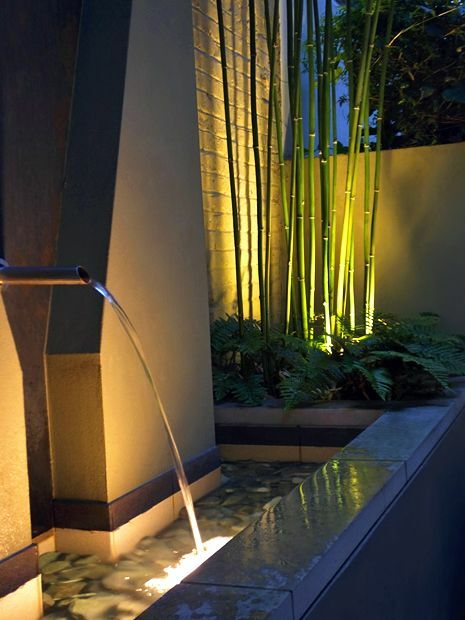 Dissolving this architectural orthodoxy into a meaningful, leafy and lightful courtyard garden, Japanese nuances softly interlink in playfulness of scale with towering Narihira bamboo, fire and water alignment, graceful Maple trees and a supersized central water feature design. As pint-sized as indeed it may be, the small town courtyard garden boldly aggregates sheer expansiveness way greater than the entirety of its diminutive parts, accomplishing candidness of purpose and plentiness of usage via accuracy of constructional execution and horticultural acumen. 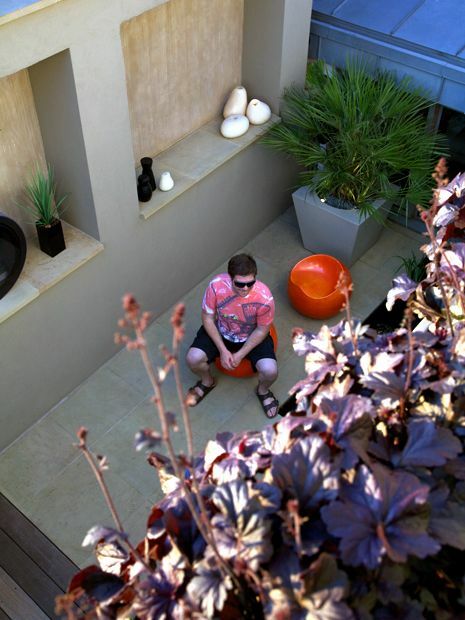 A small courtyard patio garden in South West London SW18. 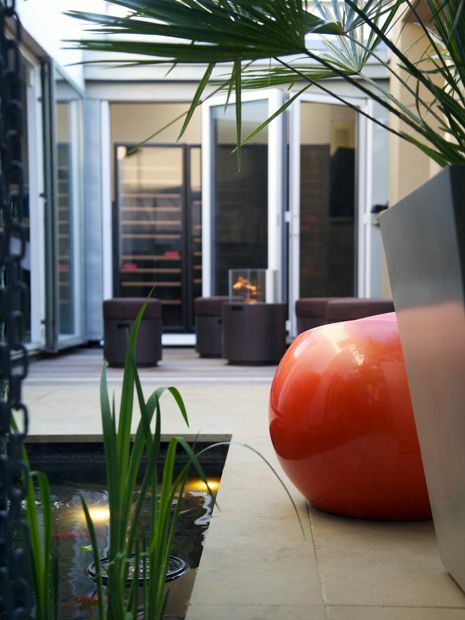 Staggeringly small, at 25 square metres of subterranean narrowness, the design for this pocket courtyard garden maximises every inch of available space to provide a daily dose of patio awesomeness – both horizontally and vertically. 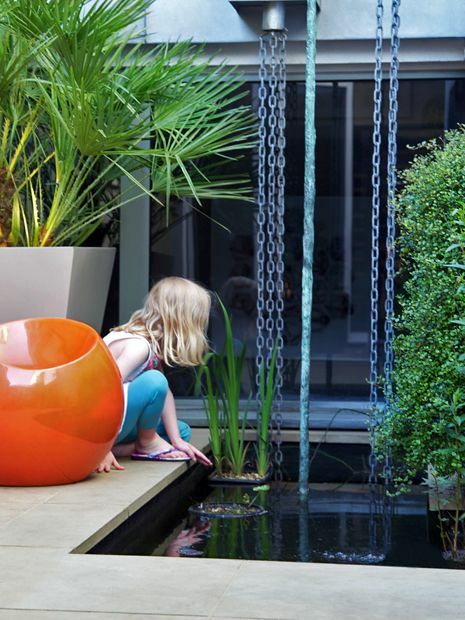 Our client's passion for contemporary art permeates each elevation, where sculpture submerged in a fish pond, perched across natural surfaces and displayed within a 3-metre-high alcoved wall animates a shaded yet vibrant London courtyard garden. 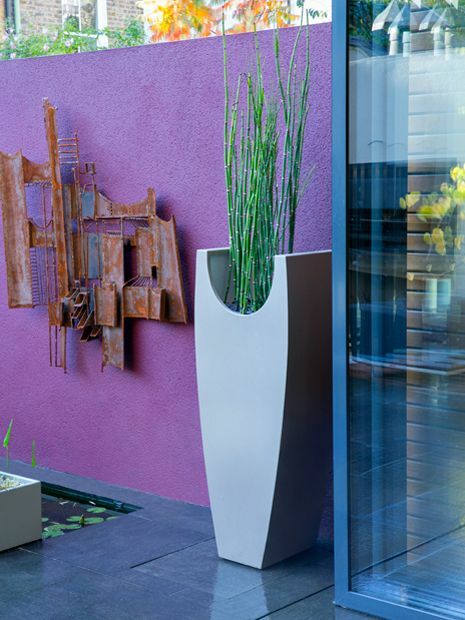 Fiercely focused, intensely concentrated and vigorously functional, small town courtyard garden designs imbue balanced architectural lyricism amid inescapable urbanism. While at times paradigmatically essentialised into bog-standard boilerplate frameworks via dogmatic selectivity, small city courtyard gardens remain classic wellsprings of residential revivification, with rich visual pickings, ample inspiration and aesthetic sophistication. 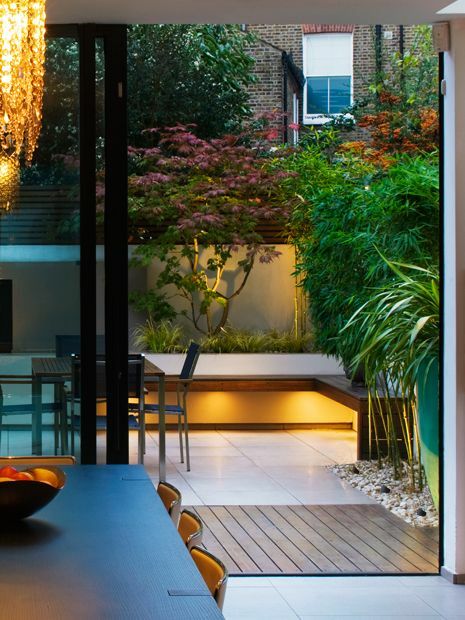 These compact gardens, their fittingly concise designs and efficient constructions, condense prototypical blueprints into unexpected settings, where we seek fresher, niftier and certainly greener ambiences to dispel the London daily grind!